As I promised on Facebook last week, this week is going to be full of Valentine’s worthy treats. Lots of pinks and reds. And of course some chocolate too! 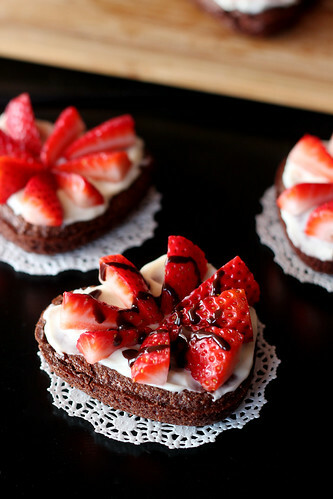 These Individual Strawberry Brownie Tarts are the perfect dessert for impressing your Valentine. A rich and chocolatey brownie topped with a delicious (and simple!) 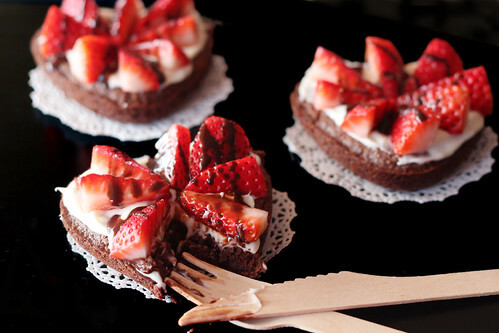 cream cheese frosting, juicy strawberries, and drizzled with chocolate syrup. Decadent and impressive, but surprisingly easy! For the brownie I stuck with a simple one-bowl recipe. While the brownies were baking I cleaned out the bowl and used it for the simple frosting. If you realllly wanted you could make them just a few steps easier by using boxed brownie mix and store bought frosting, but you might find that the (very few) extra steps for the homemade version are worth it. And you can definitely use store bought chocolate syrup (like Hershey’s). 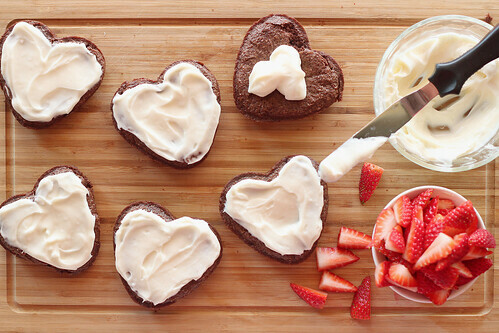 As for the “individual” part of this dessert – I used a this heart shaped mini-cake pan from Wilton. 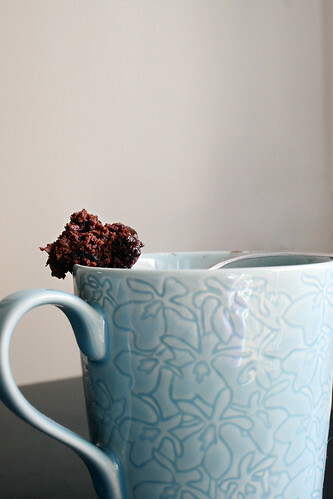 You could also use ramekins or even a regular muffin tin (making 12 instead of 6, so they aren’t too thick). Or if you don’t feel like messing with individual dessert you could also use a pie pan, tart pan, or spring-form pan. No matter which option you choose, I’m sure your Valentine will be impressed!! Spread cream cheese frosting over tops of brownies. Top with sliced strawberries. Drizzle with chocolate syrup. Preheat oven to 350 degrees and generously grease desired baking dish. (I used a 6-cavity heart shaped mini-cake pan). Place butter in a medium microwave safe bowl and microwave just until the butter is melted (15-30 seconds depending on strength of microwave). Remove from microwave and add sugar, stir with a wooden spoon until combined. Add the vanilla and eggs, stir until combined. Add the flour, cocoa powder, baking powder, and salt, stir until combined. Finally stir in the chocolate syrup. Bake for 18-20 minutes or until the edges just start to pull away from the pan. Allow to cool in the pan for 2-3 minutes, then carefully remove (if using a muffin tin or heart shaped pan to make individual tarts, flip out onto a cutting board). Allow to cool completely before frosting. In a medium bowl, use a hand mixer to beat cream cheese until smooth. Add the powdered sugar and start mixing at a lower speed and gradually work up to high speed. Add the vanilla and beat to combine. If needed, add tiny splashes of milk until the frosting reaches desired consistency. If it seems to runny, add more powdered sugar. >Attention: If you do not have any self control when it comes to chocolate then stop. Stop right there. Don’t read on, this is dangerous. What’s so dangerous about that coffee mug? 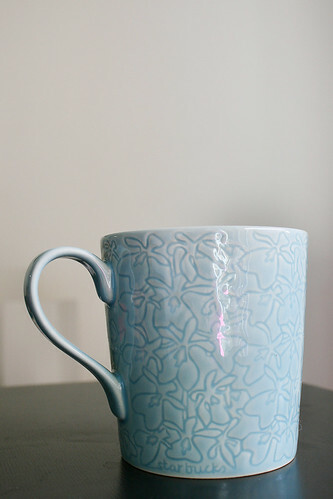 Just a pretty blue coffee mug. Oh yeah, is that all it is? How about now? Oh, big deal coffee and little bite of cake. What’s so dangerous about that? What’s so dangerous you ask? 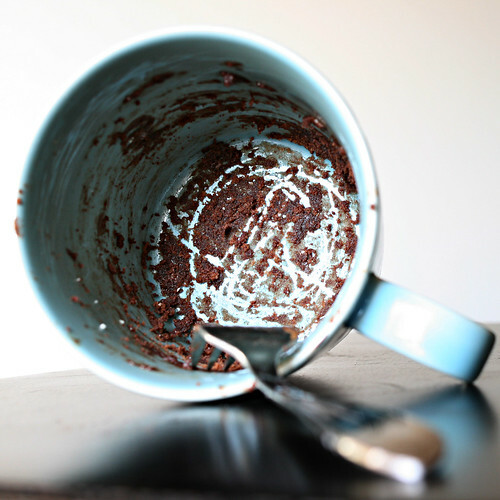 Chocolate brownie cake in a mug in less than 5 minutes. That’s what. Sometimes I just crave chocolate. But I don’t always have the time to bake an entire cake or batch of brownies. Not to mention the dishes, oh the dishes. It’s times like that, that this recipe is going to be dangerous. It’s not going to replace the recipe you use for a party or a birthday cake, but when you’re watching a movie and can’t shake a chocolate craving, this’ll do it. 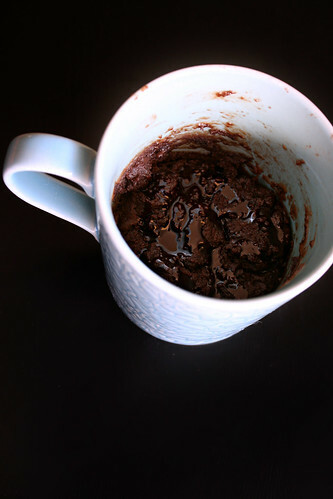 In a coffee mug stir together the flour, sugar, cocoa powder and a dash of salt. If you’re using chocolate chips, add them now. Add the vegetable oil and milk and stir well with a fork. Make sure to break up all the clumps. Microwave for 1 minute. It should still look a little moist on top. Drizzle with a little chocolate syrup if you like or just take a seat on the kitchen floor and eat it with the same fork you mixed it with…. Not that I’ve ever done that.